Tooth bleaching also known as tooth whitening, is a common procedure in general dentistry but most especially in the field of cosmetic dentistry. This darkening is due to changes in the mineral structure of the tooth, as the enamel becomes less porous. Teeth can also become stained by bacterial pigments, foodstuffs and tobacco. The procedure to bleach teeth uses oxidising agents such as hydrogen peroxide to lighten the shade of the tooth. The oxidising agent penetrates the porosities in the rod-like crystal structure of enamel and oxidises interprismatic stain deposits, over a period of time, the dentine layer, lying underneath the enamel, is also bleached. Teeth whitening (also referred to as "teeth bleaching") utilizing at-home tray-based teeth whitening products has become the most popular way for dentists to help their patients obtain whiter smiles. This type of teeth bleaching system makes use of a plastic bleaching tray. Whitening gel is placed into the tray and it is then seated over the dental patient's teeth. The bleaching tray is then worn for multiple hours per day (or else overnight), for some weeks, while the effects of the teeth whitening process take place. What are at-home tray-based teeth whitening systems? While there are several different systems a person might use to whiten their teeth (bleaching teeth), in the last decade it is tray-based whitening that has become the most widely utilized at-home teeth bleaching method. This technique utilizes a custom formed plastic tray that fits comfortably over the wearer's teeth. Bleaching gel (carbamide peroxide) is placed into this tray and the tray is then worn for multiple hours a day (or else overnight), for some weeks, as the effects of the whitening process take place whitening gels have been recognized as safe and effective, what causes teeth to become darkened or stained, when does this type of teeth whitening process work and under what circumstances might it not, how long you can expect the teeth whitening effects to last, the specific steps involved with tray whitening systems, teeth whitening costs, and a discussion about side effects and safety concerns related to carbamide peroxide teeth whiteners. Are at-home tray-based teeth whitening systems a good choice? At-home tray teeth whitening can be a safe and effective way for a person to bleach their teeth, but it is important for anyone choosing to utilize this type of system to realize that essentially all of their whitening treatments will be performed on their own, with absolutely no direct supervision by a dental professional. Because of this, anyone bleaching their teeth must be certain that the specific whitener they are using is safe, and that they know how to use this product in an appropriate manner. Failure to meet either one of these conditions could result in damage or harm. About at-home teeth whitening products: Know what you're buying. There are a wide variety of tooth bleaching products that are available to you as a consumer, both from your dentist and also over-the-counter (i.e., drug stores). You might assume that any tooth whitener which is available has been approved by the U.S. Food and Drug Administration (the "FDA") but this is not the case. The FDA does not categorize tooth whiteners as drugs and therefore it does not regulate them. As one of its functions the American Dental Association (the "ADA") has chosen to set guidelines for dental products. These guidelines dictate standards for both safety and product effectiveness. In the case of at-home tooth whiteners, the ADA's guidelines state that a whitener (when used as directed) must not be harmful to either teeth or the soft tissues of the mouth, and that it can effectively whiten teeth. A manufacture can, at their own effort and expense, present to the ADA findings drawn from their research and clinical trials. If the ADA finds that their guidelines have been met by this data they will issue to the manufacturer, for that specific product, the ADA's "Seal of Acceptance." Since earning the ADA's seal is expensive and time consuming for a manufacturer, and optional, earning this seal clearly demonstrates a company's commitment toward creating a quality product. Those manufacturers who have earned the ADA's seal will usually display it prominently on their product's packaging. As we all know, many products are manufactured as "generic equivalents." It is very possible that your dentist has reviewed the literature detailing the properties of the product they have dispensed to you and are satisfied that it is appropriate. As you might expect with a generically equivalent product, its manufacturer might not seek the ADA's seal as a way of minimizing the expense of bringing the product to market. The product you have may contain a level of carbamide peroxide that is greater than 10%. As a result of their clinical experience and what they have read in dental literature, your dentist may feel that a whitener containing a concentration of carbamide peroxide that is in excess of 10% is indicated and appropriate for your use. In this case, you should always feel free to quiz your dentist so they can relate their specific thoughts and rationale to you. The only at-home tooth whiteners (peroxided based) that have yet been able to earn the ADA's "Seal of Acceptance" are tray-based dentist-dispensed products. No over-the-counter products (such as those sold in your local store) have earned the ADA's seal. What influences the shade of teeth? When will at-home tray-based teeth whitening work? At any point in their lifetime the precise color of a person's teeth can be influenced by a multitude of factors. Before the use of an at-home tray teeth whitening (teeth bleaching) system is initiated it is important for your dentist to evaluate the possible causes of your tooth discoloration. Having an idea of what has caused the discoloration can help your dentist estimate how much lightening effect the teeth whitening treatments can be expected to achieve. 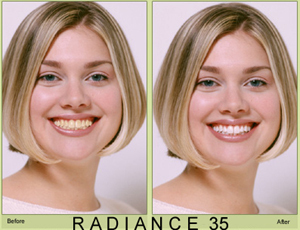 All teeth have an intrinsic (baseline) color. The teeth of humans, as a race, display a wide range of different shades of white. There is no one specific color that a person's teeth are supposed to be or should be. Some people's teeth are just naturally lighter in color than others. The coloration of a person's teeth can be altered by repeated exposure to chromogenic agents. It seems to be a fact of life that as years pass a person's teeth will have a tendency to stain and discolor. The degree to which a person's teeth will darken can often be correlated somewhat to the amount of exposure they have had to "chromogenic agents" such as tea, coffee, colas, red wine, and tobacco products. Reasons why a single tooth might become discolored. There are times when a single tooth has experienced certain types of changes or events and as a result has become darker than its neighboring teeth. As an example, it is commonplace that a tooth that has had root canal treatment will darken over time. Another common example is a tooth that has a history of having been traumatized, such as having been bumped in an accident. In this latter case the darkening can be indicative of a problem associated with the health of the nerve found inside the tooth. Any individually darkened tooth should always be evaluated by a dentist. At-home tray-based teeth whitening can possibly lighten teeth that have porcelain veneers. There is an exception to the rule that existing dental work will not lighten when a teeth whitening process is used and this exception involves teeth that have porcelain veneers on them. Porcelain veneers are translucent shells of porcelain that have been bonded onto the front side of a person's teeth. While the tooth bleaching agent will not change the color of the veneer itself it will be able to permeate the tooth from the backside, thus lightening the tooth structure that lies under the veneer. Because veneers are translucent, the net effect can be that the tooth, from the front side, appears whiter. Complications associated with trying to whiten teeth that have gum recession. Some people have gum recession on one or more teeth. Usually the root surface that has become visible because of the gum recession has an appearance that is somewhat darker than the rest of the tooth. This is because root surfaces are not covered by enamel but are instead composed of another naturally darker material termed dentin. Tray teeth whitening systems won't effectively lighten dentin. This means that the color of the root portion of the tooth (which shows where the gum recession has occurred) will not change noticeably as a result of your bleaching efforts.